The All India Football Federation (AIFF) will bid for some major global and continental football events in the coming years. These include the FIFA U-20 World Cup in 2021 as well the AFC Asian Cup in 2027. While the Asian Cup is far far away and the bidding process will begin only after 2025, the bidding process for the FIFA U-20 World Cup in 2021 could start next year. Like the FIFA U-17 World Cup for men, the AIFF has already expressed interest in hosting the FIFA U-17 World Cup for women in 2020. Apart from this, the AIFF hopes to host at least one FIFA or AFC mega event every 2 years. "Mega events help galvanize efforts of all stakeholders such as central and state government agencies, corporates, schools and other sports enthusiasts towards ensuring mass outreach and the development of football in the country," the AIFF's strategic plan for 2019-2022 reads. "The youth teams will get exposure by competing with world-class teams thereby resulting in raising the profile of the country. The mega-events will also confirm the continuous usage of the stadiums and other football facilities that were developed for the FIFA U17 World Cup India 2017. "This shall help generate additional revenue and further streamline the professionalization of the sports industry by providing long term employment to sports professionals in the country with the single aim of putting the best foot forward for the nation. "Given such benefits, the AIFF shall aim to host at least one FIFA or AFC competition every two years." In the next couple of years, the big events in the FIFA and Asian calendar are 2021 U-20 World Cup, 2022 AFC U-23 Championship and 2022 Asian Cup for Women. The AIFF will throw its hat in the ring for all these events and hope to get the approval for at least one. The AIFF hopes to put the six venues developed for the 2017 FIFA U-17 World Cup to better use and wants to keep its legacy programme. Even as the Indian national football team was firing blanks in FIFA World Cup qualifiers, AIFF president Praful Patel built castles in the air about India making the 2026 FIFA World Cup in North America. 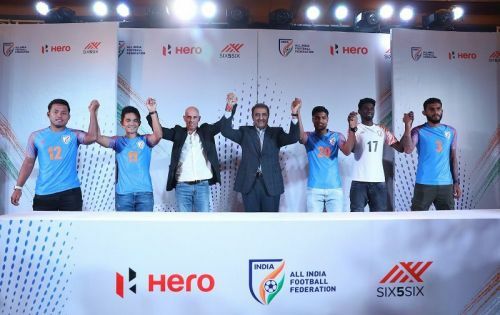 The AIFF's strategic plan, however, has modest expectations for the national team, which is just achieving qualification for the 2023 Asian Cup. The AIFF has grand plans for the U-23 team. It hopes the Indian U-23 side qualifies for the 2020 edition of the AFC U-23 Championship in Thailand and finishes in the top 16. For 2022, the AIFF thinks the U-23s will reach the quarterfinals at least. Similarly, the AIFF, through its Baby Leagues scheme, wants to develop the U-16 team and make it finish in the semifinals gradually in the AFC U-16 Championship. One can access the AIFF Strategic Plan here.